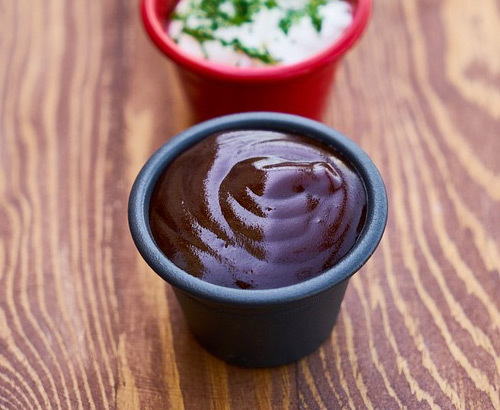 If you like your sauce a bit more barbecue flavoured, just like on Domino's Texas BBQ, then this bbq sauce recipe is for you! Partner it with our Dominos pizza dough copycat recipe and you have one tasty pizza in the works! This sauce is best made a couple of hours before you start on your base, and can easily be kept in the fridge to keep longer. Your road to making the perfect BBQ pizza starts now! In a small saucepan combine the tomato sauce and olive oil and then heat over a medium heat. Once the sauce reaches a simmer add in the onion and cook for 5 minutes or until the onions have softened. Stir in the rest of the ingredients and bring to a boil. Once boiling reduce to a simmer until it starts to thicken. this will take about 20 minutes. Stir occasionally. After 30 minutes pour the sauce into a pot or container and allow to cool. Allow to cool on the kitchen side and then move to the fridge so it’s ready to go when you make your pizza.